DURHAM — Around the turn of he century, the Bull City was a thriving center for African American business activity. In the late 1800s, three young visionaries started the first black-owned insurance company. North Carolina Mutual Life set up shop on West Parrish Street. Mechanics and Farmers Bank followed N.C. Mutual’s lead. Before long, a core of businesses owned by African Americans thrived and prospered on Parrish Street. Despite the segregation and discrimination faced by so many in the early 1900s, blacks in Durham enjoyed the highest per capita income, and the highest rate of home ownership, in the country. 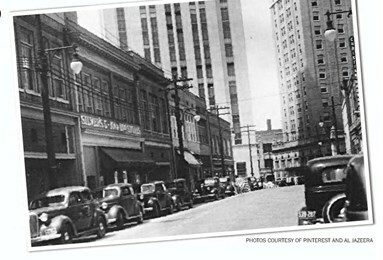 Even though the street is no longer a nationally recognized financial center for the African American community, many who work here today are well aware of its history and heritage. Attorney Butch Williams runs a thriving law practice on Parrish Street. He says the founding fathers of the “Black Wall Street,” who came here so many years before him, weren’t bullish on just the Bull City. The first home of North Carolina Mutual still stands on Parrish Street. The bank houses an exhibit on “The Black Wall Street of America, which is open to the public. • Location: Heritage Room, 12th floor N.C. Mutual Life, 411 W. Chapel Hill Street in Durham. • Hours: Monday – Thursday 8:30 a.m. – 5 p.m. Friday 8:30 a.m. – 12:30 p.m.
• Walk-ins are accepted, but scheduled tours are preferred. • For information, call (919) 682-9201. Mechanics and Farmers Bank is still in its original location, but not for much longer. The bank has just announced it will move to a new building outside the downtown area.